“The 1960s . . . . was a decade like no other—a high-speed kaleidoscope of the civil rights movement, assassinations, Bob Dylan, the Vietnam War, hippies, America’s first real antiwar movement, organic food, the Beatles, massive riots in several cities, the first riots on college campuses, Black Power . . . .
O’Donnell’s writing—clear, concise, conversational—truly brings the 1960s to life for readers. Those who were alive and aware back then might say, “Yeah, that’s what it was like.” Readers learning the details second-hand will feel transported back to that iconic era. 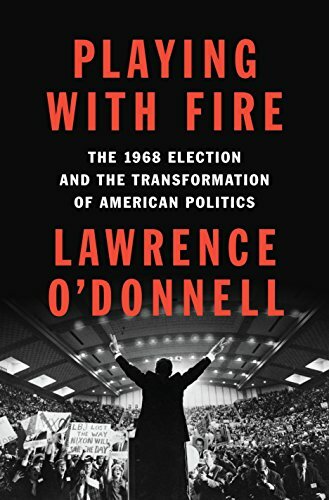 But just as the reader might protest that history is more than the sum of innumerable personalities, O’Donnell takes a wider view and provides concrete lessons into the workings of politics as played out in the 1968 presidential primary campaigns. O’Donnell describes Bobby Kennedy’s torturous indecision about running as an antiwar candidate against President Johnson in the primaries, and how Eugene McCarthy instead took up the antiwar mantle with surprising success. In fact, a good portion of the book revolves around McCarthy, about whom O’Donnell concludes, “no one did more to stop the killing in Vietnam.” O’Donnell goes on to describe the dilemmas of all the antiwar political operatives during the primaries, many unsure of whom to support. He tells of President Johnson’s shocking decision to drop out of the race in the face of such opposition, and the emergence of Vice President Hubert Humphrey as a flawed and unsatisfactory candidate, a formerly powerful liberal, now unable to extract himself from the broad shadow of an unpopular president. Meanwhile, a familiar figure watched happily from the wings—Richard Nixon. Reviving his political career after losing the 1960 presidential election and the 1962 California governor’s race, Nixon became, as O’Donnell explains, the “New Nixon,” more moderate, more acceptable. He created a fresh persona, somehow palatable to both liberal and conservative Republicans (yes, there were liberal Republicans in those days) as well as to Southern segregationists, and publicly supporting the President’s Vietnam policies, yet undermining them whenever possible. Then in April and June of 1968, two horrendous events occurred and, after each, America was never the same. In April, Martin Luther King Jr. was killed. In June, Bobby Kennedy fell to an assassin’s bullet. O’Donnell manages to convey these two unthinkable events with the gravity and emotion they deserve, while also fitting them into the narrative of the political events of 1968. O’Donnell next takes readers to the Republican National Convention in early August of 1968, where the “New Nixon” and his people strategically fended off challenges from the party’s liberals, led by Nelson Rockefeller, and conservatives, led by Ronald Reagan, while still mollifying the segregationists under South Carolina Senator Strom Thurmond. But O’Donnell’s gripping play-by-play narrative of the Republican convention can’t match his description of events at the much more spectacular Democratic National Convention in Chicago later that August. In another vivid scene, O’Donnell describes the Chicago police pushing protesters and bystanders through the shattering glass window of a restaurant just outside the convention hotel and then beating people inside the restaurant indiscriminately. All the while, bitter political infighting was going on at the Democratic convention a few miles south of the hotel, exemplified by Chicago Mayor Richard J. Daley yelling an anti-Semitic epithet at a convention speaker who favored antiwar senator George McGovern. After describing the “inside game” at both conventions that brought the election down to a contest between Richard Nixon and Hubert Humphrey, O’Donnell arrives at that monumental election itself; and this is the point where the book will really take the reader’s breath away with newly released information that Richard Nixon likely engaged in criminal and treasonous behavior to win that closely contested election; and remember, this was years before Watergate. Nixon’s behavior remains a crime that was never prosecuted or widely publicized, even though Lyndon Johnson and others knew about it. What was Nixon’s horrendous crime—a crime that cost many thousands of lives? Some book reviews provide spoilers and give away major details of a book. And in interviews, O’Donnell himself often reveals Nixon’s crime. But this review will leave that discovery to the reader. Rest assured, it will be an amazing revelation. More important to the book than Nixon’s crime is the larger narrative of the Vietnam War. That is truly what this book is about. Everything revolved around the war: it made America a different country, it brought the title’s “transformation of American politics,” and its effects persist to the present day. Yet many Americans today at times seem extremely uninformed, even ignorant, about that war. For example, Donald Trump has given Vietnam-era draft dodgers other than himself a bad name. Just a cursory skimming of Twitter will show that many very smart anti-Trump voices blithely generalize about Vietnam-era draft dodgers, calling them, cowards, traitors, and much worse. Yet many, perhaps most, draft dodgers were resisters, ranging from being completely against the war to simply refusing to risk their lives and kill others in an unpopular and arguably unjust war. They were part of a wider resistance movement, one that can provide a model for today’s resistance against Trump and his policies. O’Donnell thus educates readers as he explains Vietnam, a war wholly unlike World War II, for example, in which patriotic fighting forces protected our freedoms and way of life. Vietnam, O’Donnell explains, was an undeclared war based on untruths and questionable geopolitical theories, a war foisted on the American people by a domineering president with scant Congressional oversight. It was a war that brought life-or-death anxieties to every young man or anyone with a loved one of draft age. O’Donnell powerfully describes the lives of his older brothers and their friends—young men who’s lives were on hold, who might any day be drafted and killed or forced to kill in a war waged by a stubborn president. And, O’Donnell continues, that president gained Congressional approval for the war by falsifying the account of an attack on an American ship in the Gulf of Tonkin off Vietnam’s shore, and was largely concerned with his own legacy and with not being the first American president to lose a war, even as the daily death tolls rose. O’Donnell’s Playing with Fire offers readers a lot—much more than the average book. It can be an escape into an earlier time, and away from the political craziness of the Trump era. Conversely, it can be a model of how to form a resistance to a president who ruthlessly wields power and is fast and loose with objective truth. It can provide the lesson that our nation emerged from the midst of insanity before the Trump era, yet only with the work of many committed individuals willing to get involved, from making hard decisions to run for office and buck conventional politics, to simply working at the level of grass-roots organizing. It’s a lesson that hard work pays off and that the unexpected can happen. And the book provides a broader lesson in American government and politics. What exactly was transformed, as the book’s title suggests? Many things changed: the nation’s first antiwar movement had great success, urban police forces became militarized to face rioting, liberal Republicanism died a decisive death, conservative media guru Roger Ailes began his ascendance, presidential conventions saw the partial end of the “inside game” of winning delegates for the establishment candidate. On his TV show, O’Donnell has said that 1968 was the year that the Republican Party finally coalesced around an acceptable conservative candidate. Fifty years later, he continued, those same conservative Republicans brought us Donald Trump. This book is not perfect. At times, the author offers the innermost thinking of a major figure; but a glance at the notes in the back might not always show a source. At other points, especially in the narrative of the primaries, the chronology might seem disjointed, partly because O’Donnell has chosen not to use past perfect tense. And some of the character sketches go beyond the level of detail a typical reader might need, such as the long tale of George Romney, who is not too well remembered today. But these are small matters. Playing with Fire offers readers a vast tapestry of ideas, personalities, events, and stories—a fullness that can enrich and educate readers in numerous ways. Michael Lipkin has been a writer and editor in educational publishing for more than 35 years, specializing in history, government, economics, geography, and other subjects. He has worked on staff for two top-five publishers and has been a freelancer for just about every major educational publisher and numerous smaller independent companies.